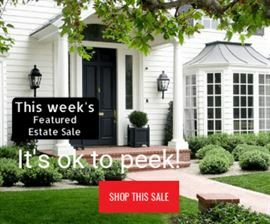 Estate Sale SuperStore - New Estates are in NOW! 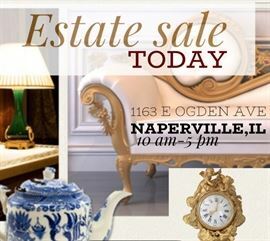 AddressThe address for this sale in Naperville, IL 60563 will no longer be shown since it has already ended. Click The button that says ( VIEW MORE ) to actually see links to prices and more photos. Thousands of Unique Estate Sale Finds on This Nationally Featured ESTATE SALE. Simply Click on any Link below to see thousands of Estate Sale Finds and to send your offer today! It's like going to over 300 estate sales in 1 location! We are liquidating hundreds of Estate Sales TODAY! Furniture, Art, Collectibles, Tools, Jewelry, Antiques, Vintage, and so much more! Everything here was brought from Estate Sales! Our clients preferred to have everything moved offsite to our store / warehouse. Come and make us an offer today! ALL REASONABLE OFFERS ARE CONSIDERED!